The view of El Centro down the alley from McClellan. Photo by Joel Lee. I was walking to light rail yesterday when I noticed that the alley behind the station is a perfect straight shot to El Centro—it almost frames the building like a painting. I had not thought about this alley much in the past. I imagined it someday being a little-used space filled with dumpsters and graffiti, tucked between two large condo buildings where the only use it might get would be the occasional employee taking a smoke break. But seeing it yesterday helped me re-imagine the space. What if instead of it being a forgotten space behind some buildings, it became Beacon Hill’s Post Alley filled with micro businesses? It could be an extension of the planned courtyard at El Centro and a useful arm of Festival Street. 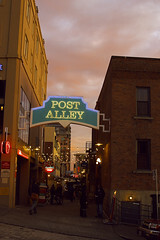 For those of you that don’t get downtown much, Post Alley is an offshoot of the Pike Place Market. It is a pedestrian-friendly sort of mini-market where many smaller businesses have been able to take root in its less-than-prime real estate. It includes Seattle’s famous gum wall. Photo of Post Alley at sunset by zenobia_joy. Rarely do neighborhoods get a chance to redefine their “downtown” the way that Beacon Hill will with light-rail and El Centro’s future development, and I’m hoping that with imagination and thoughtful planning, we will be able to maximize our potential. Joel Lee maintains the Beacon Hill Public Art website. Do you have an opinion? We welcome opinion articles on topics related to Beacon Hill. Please email us your ideas. This is a great idea. What a great spot for this! I really like this idea, but I’m having a hard time imagining how the buildings would look. How could a micro-business afford the rent on the new construction? Or would it start with booths and stalls? Actually, I wouldn’t mind a row of street food vendors (like the people who sell tamales at McPhersons), produce trucks (like the people who sell cherries on Beacon by the VA), handicrafts (like the stalls at the Pike Place Market), and clothing accessories. They wouldn’t all have to be there every day. It could start with more on weekends. I envision something like the University District farmer’s market. @ Charlie, imagine a pedestrian friendly sidewalk and lighting and maybe just 8 feet of open space carved into the buildings on either side where vendors could set up booths. The building owners wouldn’t have much to lose since this would have been a non-income generating space anyway, they could charge very low rent. Maybe even just install awnings on both sides and create a narrower walkway down the center. Building owners wouldn’t lose any square footage at all and the spaces could be controlled by a neighborhood non-profit. Try to remember that even Starbucks was once a tiny shop in Pikes Place market. Who knows what the next big thing will be? But it would be nice if we set up a space where small vendors could try out big new ideas. Thinking bigger on this space (per Charlie’s comment) a home run would be for the city to acquire that triangle piece of property for a micro park…JUST the kind that is called for in our updated neighborhood plan. They you’d have just the space for cart business and small palazzo for outdoor dining, a fountain perhaps etc. A real core focal point for our beautiful (urban) village. Wonder if there is grant money for doing this available and deadlining soon? Hmmmm…. Joel and Adam, your ideas are wonderful. I love the idea of an outdoor market/post alley and central park with fountain! Thanks everyone, I don’t think that this is that nutty of an idea. Just rethinking what we already have. I’m sure this kind of thing could work in that area, but I think the two challenges would be to get the DPD to sign on and convince the property owners/developers. The property owners would essentially be getting more valuable store frontage so I hope they could see this as a bonus and I think that the DPD would get behind it if the community supports it and some of the details could be worked out. Even if this area is not used as a market I think that it’s location is too nice to be used just as an alley. I would love to see something more pedestrian friendly like outdoor seating for adjacent businesses and a nice safe well lit walkway between existing areas. This is part of an complete alley idea that Brian Court (I think) started proposing as a part of neighborhood planning. With the extra year to do planning before we resubmit for adoption in 2011, we can get these things worked out and into our neighborhood plan. 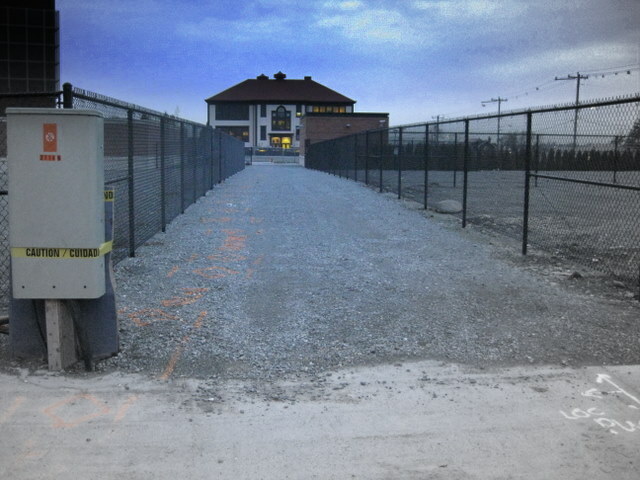 Brian’s idea includes this alley, the alley between Beacon and 16th and a future alley if Red Apple goes to development. I’m glad to see the idea of pedestrian alleys for our town center getting some attention. When I’ve been in discussions around this idea, we talked about the axis from the library to El Centro, and seeing that alley as you’ve described it. If you were to continue walking north, imagine crossing Lander St, onto a new El Centro development that directed you to a plaza space adjacent to the existing historic school building, then pivoting out to the alley between Beacon and 16th with new and existing businesses facing the alley. That would take you to Bayview, where if you turn west, you’ll be on 15th, near the Junction. Another pedestrian friendly idea to come from the neighborhood planning discussions is to extend the festival street paving and concept west on Lander to 15th. This would be part of improving the pedestrian crossing at Beacon and visually cue show the way to the Link Station and Town Center. The alleys can continue to be available for delivery trucks and trash pick up, but during business hours would be a pedestrian zone. Finally, I’ll add one more thing for folks to consider, and Adam may have mentioned this already. Consider the parcel on the north east corner of Beacon and McClellan, its a triangle, bordered by the station, alley and Beacon Ave. What if that parcel became a plaza, populated by food carts, small retail (carts or temporary stalls). Combined with the festival street and alley, it could be the right amount of open space for the Town Center. I look forward to more comments. Golly, I hope they don’t redevelop the Red Apple. I really like how they’ve improved the selection and quality recently, and how convenient it is. I hate grocery stores where you have to drive into some dreary garage just to pick up a few things. And I like David’s idea: That corner would be a great place for a landmark piece of art, or a big tree we could decorate for the holidays, or something fun like that. People have been emailing lots of variations of pedestrian usable streets, there are many great different examples of these all over the world. But my favorite word I’ve learned so far is ‘Woonerf’. A Dutch word for a street where pedestrians have priority over cars. Beacon Hill needs more Woonerf. Thank you David for the walk through of ideas. Lander Street is a Woonerf. Its Seattle’s first, if we treat it that way (Yeah Beacon Rocks!). Design for this alley could be a great project to enter in the Green Alleys Competition that the AIA is sponsoring: http://www.aiaseattle.org/node/3857. “This design competition is focused on potential new uses that in combination could add functionality to our transportation and ecological systems as well as improving the aesthetic and community-building elements of our City.” The deadline is Feb 22. Post Alley is a great example but there are others. For some additional inspiration take a look at what is happening with alleys in San Francisco: http://blog.seattlepi.com/insidebelltown/archives/187675.asp and right here in Seattle down in Pioneer Square. It would be great to get something like that going in our own alley. Forgot to include the link for what’s going on in Nord Alley in Pioneer Square: http://www.worldchanging.com/local/seattle/archives/010459.html. It’s that alley just across the street from Occidental Square. Okay, so my New Years resolution is to stop referring to that area as an alley and to start referring to it as a Woonerf. People have been emailing me some links so I thought I would share a few to get our collective creative juices flowing. I’m glad to see that this is not an original idea and that a lot of people are thinking the same way. Don’t forget the Cafe Allegro in the University district. While it is currently the only business fronting on the alley it is a nice little space. Brilliant Joel. But how as a community do we make this happen? The owners of that property are able to develop that property any way they want. Just because we on this blog think its a great idea, are there ways to shape the development down that alley? The owners of the property can build ‘whatever they want’ within the current building codes, but the alley belongs to us. Legally the adjacent property owners have a responsibility to upkeep the alley but it is owned by everyone and we have a say in how it is used. I think that the biggest draw for developers is that they will get more usable/appealing square footage. Would you rather rent an apartment above a dumpster that smells like pee? Or rent above a lovely neighborhood flower stand? Street front retail is the most valuable space and this idea would essentially double the amount for the property owners. Ultimately I think it comes down to being engaged, getting the property owners to work together, attending design review meetings and clearing these ideas with the DPD. There seems to be a bit of a movement going on across Seattle and you can read more about it here.